Finally! I was looking forward to seeing real life photos of the Down Town Vest but it seems that stores didn’t receive them after the upload until now. I like the simplicity of the design of this one, especially compared to last years down vest (what was it called?) which was a bit of a mess for most people with the crazy quilting, diagonal closure, belt and the fact that you had to size up substantially for it to fit. I’m not pleased about certain features lacking in this one though (zipper pockets, reversibility) Those were priced quite highly as well at $168 and ended up marked down in all colors so perhaps we will see the same here, although this design is more widely appealing so maybe not. Come to think of it, I think every years down vests eventually got marked down even with the popular designs and colors. If you’re not in desperate need of one, perhaps wait and see a bit? 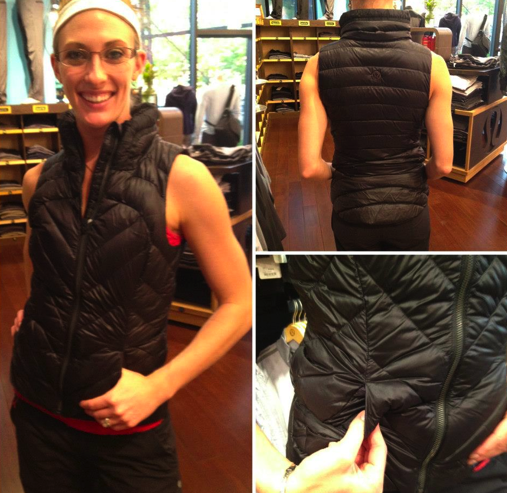 I’m actually interested in searching out the Turn Around Vest from last years cycling line which was a really low profile puffy vest – that one was a bargain at 650-fill for $128 (Bargain compared with the Down Town vest priced at $168).